Throughout his short life, Schubert wrote more music for piano duet than any other great composer. His unsurpassed achievements in this field include dances, marches, variation sets, overtures, fantasies, divertissements and sonatas. 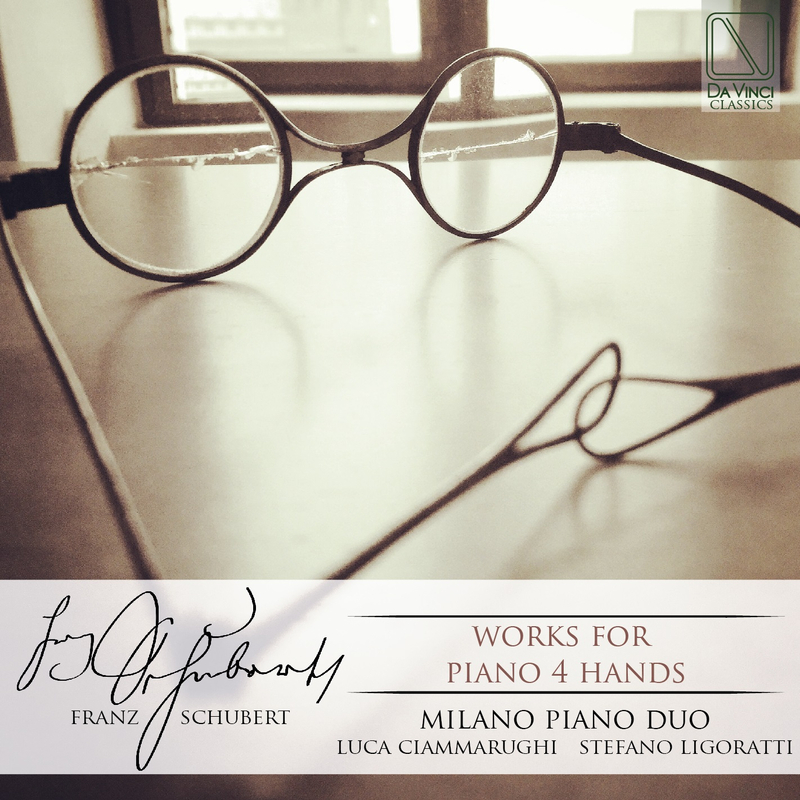 Schubert wrote his greatest piano duets in the miraculously productive last year of his life as he continued his compositional experimentation. There is no doubt that Schubert’s duets place great demands on their performer’s sense of timbre, intelligence, speed of reaction and concern for detail. All the works presented in this CD belong to the last year of the composer except the Sonata D 617 and the Three Marches D 733. The Grand Sonata in B-flat major D 617 is the first of two sonatas for piano duet the composer wrote in his lifetime, the other is the famous Grand Duo of 1824. Franz Schubert: (b Vienna, 31 Jan 1797; d Vienna, 19 Nov 1828). Austrian composer. The only canonic Viennese composer native to Vienna, he made seminal contributions in the areas of orchestral music, chamber music, piano music and, most especially, the German lied. The richness and subtlety of his melodic and harmonic language, the originality of his accompaniments, his elevation of marginal genres and the enigmatic nature of his uneventful life have invited a wide range of readings of both man and music that remain among the most hotly debated in musical circles. Ciammarughi, Luca (Pianist), studied Piano at the “G. Verdi” Conservatory of Milan and here graduated with top marks and honors with Paolo Bordoni. As piano soloist he has performed at the Festival dei Due Mondi of Spoleto, Mito Settembre Musica, Mantova Chamber Music Festival, Società dei Concerti of Milan, Salle Cortot of Paris, Amici del Loggione del Teatro alla Scala and many other institutions. He has been several times invited as a guest by Radio Tre Rai. For ten years he is everyday on the air on Radio Classica: his programme, “Il pianista”, has become a point of reference for the Italian educational panorama. Zecchini Editore edited his book “Da Benedetti Michelangeli alla Argerich” and the LIM of Lucca his monographic volume “Le ultime sonate di Schubert” and other essays about the Schubert’s lieder. He has composed the music for the short films Elsa’s kitchen and Anna e Marcel, projected in the Centre Pompidou of Paris.